"The chance to visit Germany and interact with higher-level players was a once-in-a-lifetime opportunity for a lot of the kids." -- Des Hague, Froozer Chairman of the Board and Co-Founder of Hague Enterprises. Des Hague, Co-Founder of Hague Enterprises and Chairman of the Board of Froozer®, and Justin J. Rose, owner of Germany's JJR Consulting GmbH and Founder of Funding Ones FREEDOM, are delighted to announce the successful trip of 12 American teens to Germany for a week long international soccer experience. 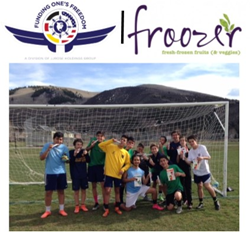 This educational trip is the first leg of the Froozer®-sponsored Colorado Cup 2016, which is scheduled for this summer. As part of the international soccer experience, Rose brought the twelve American youngsters to Germany where they participated in a week long football camp run by the Mainz 05 Football Academy. While in Germany, they were also given the chance to meet with local peers. On top of interacting with their German peers, the American teenagers were given the opportunity to meet members of the integrative amateur football club FC Duck Baghdad, as well as young refugees from different cultures. Afterwards, the US teenagers got together with students from a partner school of the Mainz 05 classroom. They visited IGS Bretzenheim that, as an elite sport center, instructs young trainees from Mainz 05. In their time spent together, both the American and German teens got to learn more about each other's cultures while connecting through a mutual love of soccer. This trip to Germany is the beginning of the opportunities that Funding Ones Freedom hopes to offer young soccer players from Colorado and beyond. Next on the agenda is the first annual Colorado Cup 2016, fueled by Froozer®, to be held at the Air Force Academy, Colorado Springs, CO on July 13. German Soccer Team Mainz 05 will battle Mexican Team Leones Negros for the Cup. As part of Colorado Cup 2016 there will be a “Celebration of Soccer Week” coming to Vail and Colorado Springs, July 11-15. "It is every American soccer player's dream to have the chance to play in Europe or somewhere abroad where soccer is the heart and soul of the country. This July, we will take it one step further and bring two professional soccer teams, a German Bundesliga team and a team from Mexico, to Colorado for those who haven't yet had the chance to go abroad and experience that," stated Rose. Throughout the "Celebration of Soccer Week," there will be youth soccer camps taking place at Air Force Academy in Colorado Springs and in Vail, a Youth All Star Girls Game followed by Mainz 05 vs. Switchbacks at Switchbacks Stadium in Colorado Springs, CO, on July 12, and a Youth All Star Boys Game followed by the Mainz 05 vs. Leones Negros Colorado Cup game at Air Force Academy in Colorado Springs, CO on July 13. "This chance to visit Germany and interact with professional soccer players may have been a once-in-a-lifetime opportunity for these American teens," said Hague. "This is special and I am glad to lend my support. During the festivities coming up in July, we're hoping to expose many more American kids to the exciting international world of soccer." "Froozer® is committing to providing samples during clinics for the kids, sponsor kids in need to participate in pro-run clinics, and make available event tickets for folks who would like to participate but may not have the means," Hague stated. "We're looking for sponsors to come on board and help us help these kids realize their dreams." Froozer® products, the official healthy frozen fruit and vegetable snack of US Speed Skating, represent the pure goodness of freshly harvested fruits & veggies picked at the peak of their ripeness, flash-frozen whole and blended for optimal taste, nutrition and digestion. Natural fruits and veggies in all their glory, nothing added or subtracted, not even a drop of water. Available in three delicious flavors - STRAWBANANA BLISS, TROPICAL SUNSET and BLUE ALOHA - in 6-pack boxes. Look for Froozer® in your local grocery store freezer at select retail locations in and around Denver, including WholeFoods and Alfalfa's, and various select retailers in Arizona, California, Connecticut, Massachusetts, Oregon, Washington State, Rhode Island and Alaska, or place your order at http://www.Froozer.com or http://www.Amazon.com to have your Froozer® delivered directly to your home or office.